Forklift Certification is the Law. your own forklift training program? Why waste thousands in fees to expensive consultants and lost wages to all-day off-site training? Use our affordable on-site forklift training, evaluation and certification program. It allows your forklift operators to get completely trained, certified, and OSHA-compliant in-house – quickly and easily at a huge savings - with no fees per operator. A small, one-time investment includes all necessary training materials, DVDs, certificates and wallet cards for proof of compliance (details below). Order now and you'll also get the entire program on a USB flash drive at no extra cost. Take it anywhere. Nothing to download. Unlimited printing. Try the program 100% risk-free for an entire year. If you're not absolutely thrilled with every aspect of the program, simply return it within 1 year for a prompt, no-questions 100% refund. Our affordable forklift training kit takes you through the necessary fundamentals about operating a powered industrial truck competently, safely and according to OSHA standards. Don't waste your valuable time trying to put such a program together yourself (or worry if it's OSHA compliant). Don't throw money down the toilet by over-paying for consultants or off-site training. 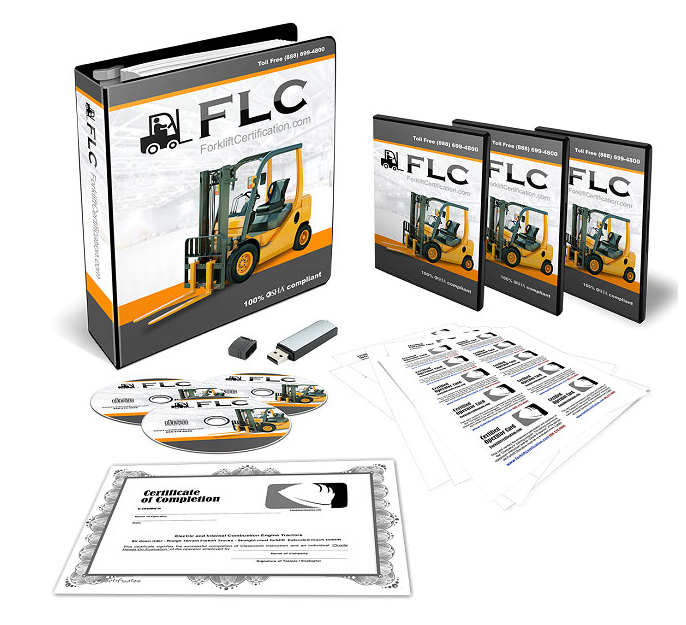 FLC's Forklift Training and Certification Kit includes EVERYTHING you need for quick, easy and affordable training and certification of all your forklift operators. LIMITED TIME OFFER: Order now and you'll also get the entire program on a USB flash drive at no extra cost. Take it anywhere. Nothing to download. Unlimited printing. As an employer in a warehouse, construction site or road transport environment, you know your forklift drivers are required to receive OSHA-compliant training and certification. One accident could run into the hundreds of thousands or even millions of dollars. For a mere $299, you get ForkliftCertification.com's forklift training kit containing everything you need to provide your employees with forklift operation training and save yourself potentially millions of dollars. I did absolutely great beacuse you provided me with all the tools i needed i did very good the instruction couldn't get any easier. the pictures are great i wouldn't change a thing. thank you !!! Great information. Love that I can do it at my own pace and don't have to do it all at once. Solid forklift training program Concisely grouped topics with a well designed test review at the end of each module. CURRENT: Developed, improved and updated over the last 15 years. You'll never be without the latest information.